Building built-in bookcases is a relatively easy project for most handymen. With a table saw and a few hand power tools you can organize and add depth to any room. 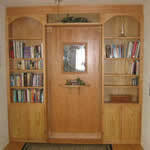 Also see: Free plans for freestanding bookcases and bookshelves. 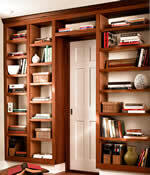 Built-in bookcase surrounds an interior door. Built-in bookcase surrounds window and provides a window seat. Built-in bookcase can house many items. Floor to ceiling built-in bookcases. 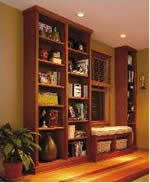 Built-in bookcase on wall with passageway. A seating bench surrounded by bookshelves. Detailed plans and instructions.